With demolition set for late this year to make way for a new bridge, tenants of the D.N. Leathers housing project in Corpus Christi have until Oct. 31 to find new homes. Many are having trouble, and say they aren't getting enough help. 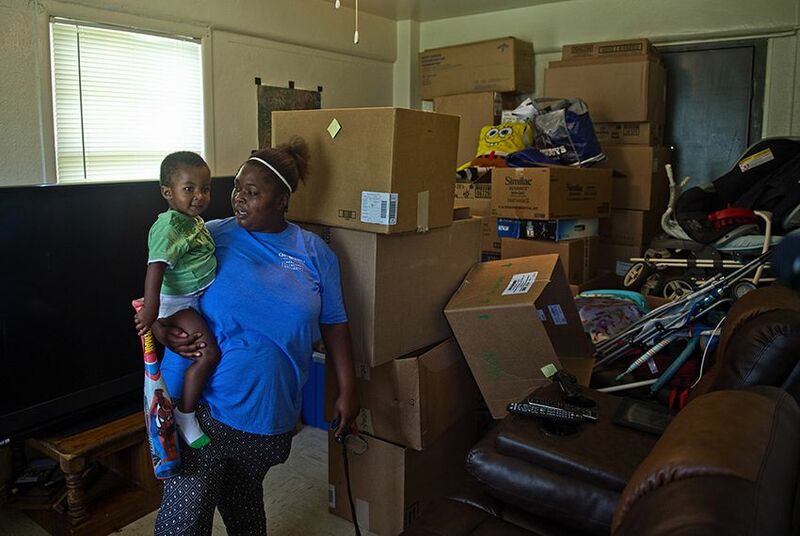 CORPUS CHRISTI — Jasmine Mosley has been living out of boxes for weeks. The cardboard towers threatening to take over her small living room remind her she is running out of time to find somewhere new to live. Mosley and her two-year-old son are among 122 families living at D.N. Leathers, a 75-year-old public housing complex, who must leave by the end of October so the complex can be torn down to make way for reconstruction of the city’s Harbor Bridge. The project, spearheaded by the Texas Department of Transportation and the Port of Corpus Christi Authority, is expected to boost the area's economy and make the 1950s-era bridge safer. For the predominantly black and Hispanic residents, it was supposed to also offer an escape from meager living in shoe box-like units in the shadow of refineries. But after months of waiting for details, many say they're having trouble finding places to go in a city where some landlords are reluctant to accept them, and that the government is offering little practical help with relocation. 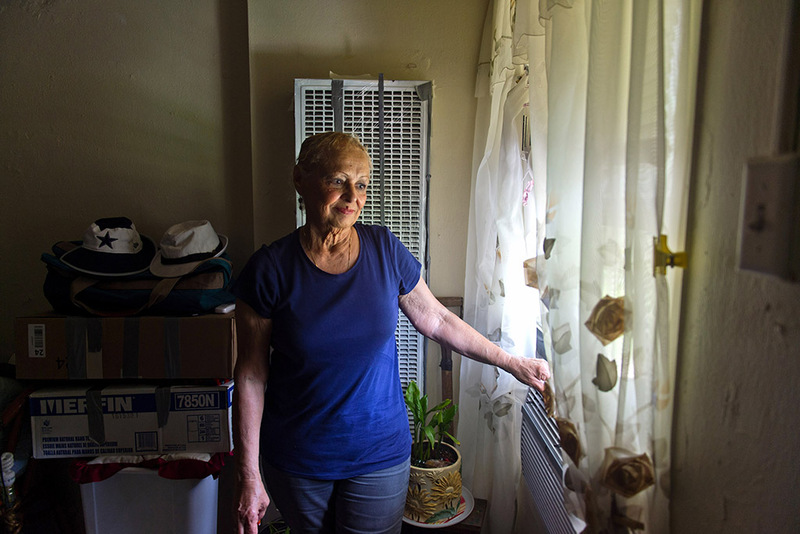 Housing vouchers they received in early August seemed to offer the possibility of fresh starts in better living quarters — maybe even places with central air conditioning — but the search for private market rental housing has proved daunting, they say. 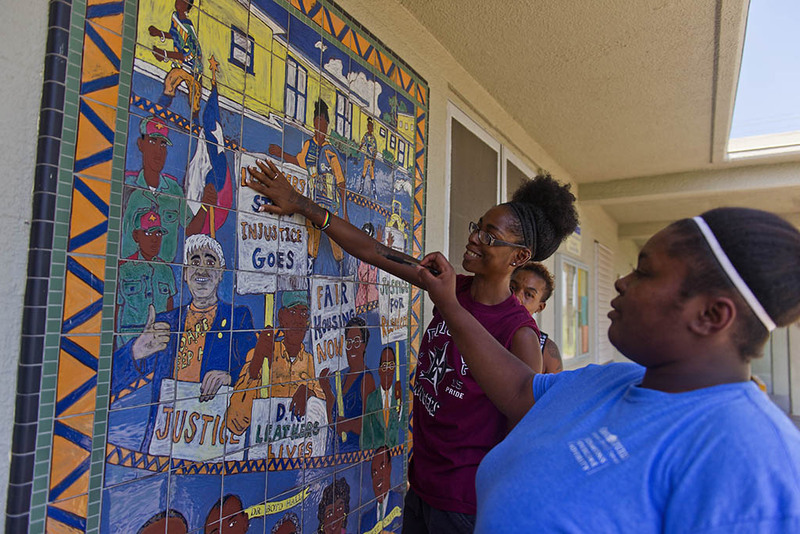 They've been promised spots in other housing projects if they want, but few do. Only about 25 families have opted to move straight into other public housing complexes. Many living on fixed incomes can't handle moving costs. Others can't scrape together security deposits. With the move-out deadline looming, many don't know where they’ll be living in a month and a half, or if they'll have much choice in the matter. The deal between the Corpus Christi Housing Authority and the state is already inked — awaiting final approval from the U.S. Department of Housing and Urban Development — and the complex is set for demolition later this year. Tenants are supposed to be out by Oct. 31, but can stay through November if they have a new place but can't move in right away. It’s unclear whether many will be able to find housing in time. But some tenants — many who have lived in public housing for more than a decade — have expressed frustration and confusion about how to find privately owned housing. Landlords in Texas are not required to accept vouchers, and even when residents find potential housing, they must navigate a labyrinth of requirements to get approval from the housing authority, including inspections. Additionally, Texas RioGrande Legal Aid claims that the housing authority’s relocation plan fails to “affirmatively further fair housing.” Most voucher-friendly properties and public housing in the city are in “low opportunity areas” with high poverty rates, and Corpus Christi is already grappling with inadequate availability of units, said Erin Gaines, a lawyer with Texas RioGrande Legal. Lawyers have also raised concerns that the housing authority is telling tenants to move out even though HUD hasn't granted its final approval of the demolition plan. Legal aid lawyers and low income housing advocates have asked HUD to delay the move out and scrutinize the housing authority’s plan. HUD has not responded to their letter, and the agency declined to answer questions about the plan. Meanwhile, things are moving forward with the Harbor Bridge project. In August, state officials, including Gov. Greg Abbott and U.S. Sen. John Cornyn, attended a groundbreaking ceremony marking the start of reconstruction. For the leaders of the Citizens Alliance for Fairness and Progress — a local group that has advocated for the neighborhoods affected by the bridge project — it was a symbol of how officials underestimated the size of the project when it comes to those being displaced. “They have planned for the bridge, but they did not plan for the people,” said Lamont Taylor, a longtime resident of the area and co-founder of the group. Residents of the Washington-Coles and Hillcrest neighborhoods, collectively known as the Northside, where Leathers is located have long been used to industrial encroachment, and the two historically black neighborhoods have deep-rooted histories of segregation and isolation. Washington-Coles was the city's primary neighborhood where blacks could own properties or rent under Jim Crow segregation. Starting in the 1930s, it became home to many low-income housing projects. Hillcrest, just to its west, was originally established as a white-only neighborhood and home to a country club. After officials recommended that Hillcrest be opened to blacks in the 1940s, the neighborhood’s population quickly flipped from predominantly white to mostly black; Hispanics would also move in. After Interstate 37 was constructed along the southern end of the two neighborhoods, industrial companies on its other sides began expanding rapidly. By last year, the neighborhoods were practically surrounded by industrial sites, the ship channel and the highway. 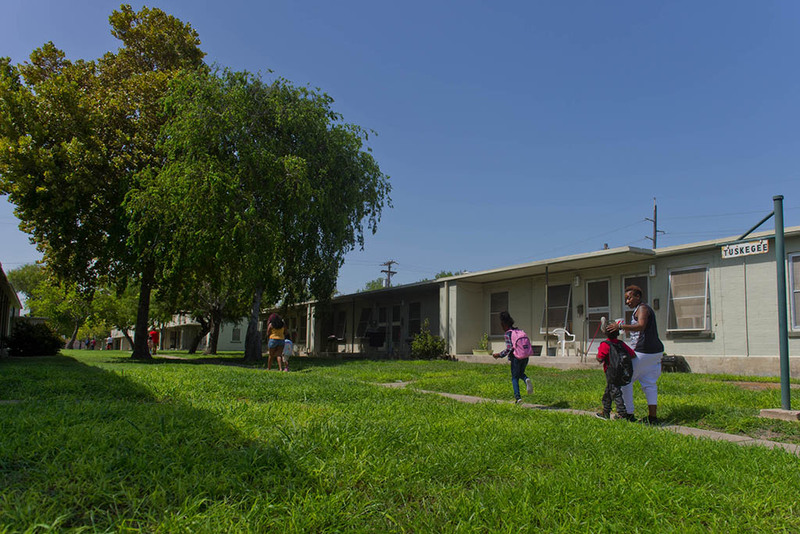 The bridge realignment raised concerns that one of the proposed routes would effectively isolate Hillcrest from the residential part of the city and cut right through Washington-Coles, leaving the public housing complex in its shadow. When that route was chosen, a civil rights complaint was filed with the Federal Highway Administration. Residents said the project would violate the Civil Rights Act because it would cause disproportionate harm based on race. The dispute ended with TxDOT and the port authority agreeing to pay for mitigation and relocation costs for Hillcrest property owners who want to move. The mandatory relocation of the Leathers tenants was part of the deal. But as challenges with the Leathers relocation have emerged, black community leaders have again invoked the decades-long civil rights fights over fair housing for people of color. The legacy of segregation and isolation combined with the priority to get the bridge in have proved a breaking point for a community that has long felt neglected by city officials. Allsup, the housing authority CEO, said the relocation of Leathers tenants is not about putting business over people. But the city and the agencies could have picked another route for the bridge, a frustrating aspect of the relocation for Oralia Gonzales, who has lived at the Leathers complex for almost 16 years. “The apartment is not pretty, but I was happy,” she said from the couch in her small unit at Leathers, which is half packed up. She knows this area. It’s home. A year after the U.S. Supreme Court allowed a lawsuit against Texas over segregated housing to go forward, a federal district judge has dismissed it.